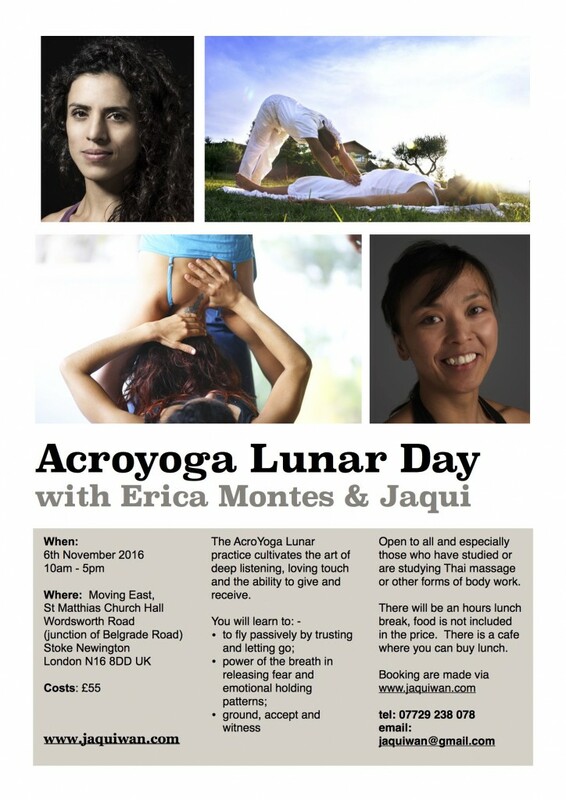 After the success of our April Lunar day, both Erica Montes and Jaqui Wan would like do it again. Share the AcroYoga Lunar practice that cultivates the art of deep listening, loving touch and the ability to give and receive. We will begin the day with AcroYoga Lunar asana to tune to our own bodies. There after we will delve into elements of Thai massage in a supine, prone and or seated sequence. We will explore the flow of energy in the body, where it maybe blocked, and how to use the breath, gravity, body weight, touch and vibrations to release, unblock and create free flow. We will introduce the art of suspended therapeutics, involving a base and flyer. The base grounds and suspends the flyer with their hands and feet to create the potential to release tension and muscular holding patterns. The passive nature of the flyer enables the base to sculpt the flyer into a variety of shapes that stretches and opens the flyers upper body. Open to all and especially those who have studied or are studying Thai massage or other forms of body work. Please note you will be asked to work in pairs or encouraged to work in small groups.